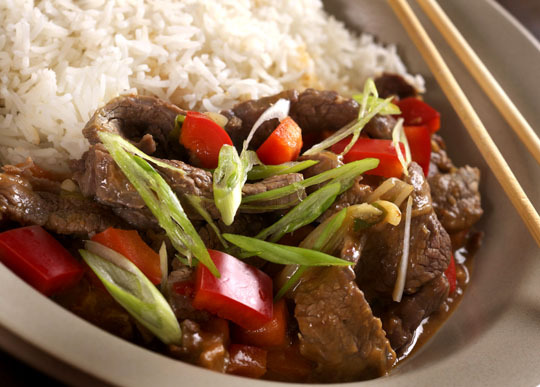 A fast dinner, beef stir-fry. Photo by Donna Turner Ruhlman. It made so much sense the second I read it. One of those “of course!” moments. It was, not atypically, while reading Michael Pollan in his NYTimes magazine story a few years ago about how no one cooks anymore (really?). Certainly in the 1980s and 1990s most of the country relied on reheating already-cooked food for their meals. And perhaps as a result, at least in part, we became a grossly obese country where seemingly the only people who dieted were the people who were already thin, and the rest made increasingly bizarre, unsustainable stabs at it. A physically sick country, a confused country—don’t get me started. The “of course” moment. It didn’t come from Pollan, but rather from a researcher he interviewed, Harry Balzer, who works for the market research behemoth NPD, and studies all kinds of eating trends. Since I read that chillingly simple idea, I’ve adopted it as a mantra. Pollan took the idea and ran book-length with it in Cooked, published this spring. Combine food you cook yourself (or a meal that was cooked by your partner, parent, progeny, or pal) with common sense and you’re on the way to a good life. In his article, Pollan mentions the work of Richard Wrangham and his superb book Catching Fire: How Cooking Made Us Human, published a half year earlier. This is another major argument in the case for the fundamental importance of food to our humanity (something that once would have seemed so obvious as to not need arguing). One of his claims is that because cooking took work, a lot of work, but came with advantages too self-evident to ignore, we had to cooperate in order to take advantage of the miraculous benefits cooked food gave to animals. I hyperventilate about Wrangham’s main premises here. Pagel’s talk made me wonder: Did cooking food, which necessitated cooperation, have anything to do with the development of language and with it the rapid growth of our species across the globe? I wrote to Wrangham to ask if he knew of any studies correlating the development of language with cooked food. He didn’t. He speculated that there may be important links but no one he knew of had written about it. He noted that we were “speaking” of spoken language, not signed, aural language and our unique capacity to create extraordinarily nuanced sounds. And this means anything from a … skeptically … uttered phrase in everyday conversation, to the artistry of Leontyne Price or Cyndi Lauper. Our vocal structures may have been able to develop because we didn’t have to send half our body weight through our throat every day in the form of chewed-up plants. He reiterated that this was idle speculation. I think it’s worth exploring. There is rarely a single explanation to a complex circumstance, but rather an infinitely nuanced self-spinning weave that reveals how we got where we are. Was it cooked food alone that enabled the language that necessitated cooperation? Idle speculation would lead us to believe that the answer is no. One helped the other over many, many generations, and many intermingling of tribes. Pagel ended with the idea that we might be headed toward one world, with one language, thereby freeing up the delay of the spread of ideas and cooperation. One thing I have learned is that there is one language everyone already understands, is eager to share, and is eager to accept, and it’s not surprising. A good, shared meal. The best language I know. Wrangham also directed me to the work of Michael Wilson, an anthropologist at the University of Minnesota who studies primates for what we can learn about human evolution. He has an excellent site of his own called Monkey Business. Civil Eats is a great resource to learn more about food policy and politics. Support local farmers by finding the ones near you at Local Harvest. © 2013 Michael Ruhlman. Photo © 2013 Donna Turner-Ruhlman. All rights reserved. Interesting idea – because we cook we can talk. Funny I talk and then I cook- or I listen to Ruhlman talk- or rant or entice and then… I cook. Love this post. there is another language that only the body knows how to understand and that is how it communicates mind to stomach is when the head is still hungry but the stomach is full and vice versa. I’d love to read a story about four (or more) chefs/cooks/whomever with no common language tasked with collectively cooking to see what happens. Chefs or experienced cooks would probably be best, but perhaps you can have separate groups. It appears to me that Michael is suggesting that not only did cooking make us human, but it kickstarted the transition from being pre-verbal to having the capacity for speech as we understand it today, rather than simple clicks and pops. Love it. Just tonight my husband and I were talking about how our really good friends, the ones that we really feel a connection to are the ones that have the same appreciation of food as us. Literally we share a language that leads to a deeper understanding between us. We have no need to extol the wonders of raw tuna to each other or persuade each other that the fat of a perfectly grilled lamb chop is the best part of the dish. Instead we sit down and tuck into a meal that we may have prepared together and explore the nuances of the textures and flavours. We COMMUNICATE. What is more, in reference to the first part of your post regarding the best diet possible (eat what you want but COOK IT), we just spent a winter experimenting with making pancetta and sausages (recipes from Charcuterie, I might add). Recently just went for full blood tests… Cholesterol levels below 200, triglycerides down and HDL well up. OK an isolated case and also probably no one here subscribes to the cholesterol danger myth here. But my point is, that piece of advice from Harry Balzar is mantra for us too. Luckily I did not need to hear about it to follow it. As far as the vocal structure it sure worked for Sally in When Harry Met Sally at the diner. Ha! There is one thing I’ve wanted so much as an adult for many years that I’ve missed. A big, shared family meal where everyone pitches in. This is the total opposite of the grunts and mmmms the gurgle forth while the mouth is chewing away at something that tastes good. Or did we have to explain those sounds with words after we ate? In response to a comment about hunting, but she gets carried away: hunting would require rather complex and intimate communication, especially hunting in packs. The hearth where at one time thought 250,000 years ago is now estimated at 1.5 million. The architecture of the brain is built partly by the jobs and interactions the environment requires of us (and can change rapidly seen in wasp and bee research). So it would be a building of experience, the diversity within tribes for “skills” and the increased nutrition. What many don’t suspect is of course the small part to what Michael suggests the building and ability to build the complex finer muscles of the throat, but what may be crucial is the brain feeling more at ease to focus on developing more social communication subtlities to build the “muscles” (dendrititc growth and connectivity) of the brain. This type of activation (mTOR) is where energy comes in but also social and behavioral regulation by stresses being managed.The environment can have its stress and dangers, but so can food. Food is stressful in that it takes work (energy) and resources. So by freeing up this energy, improving resources and decreasing the stressful byproducts our brains essentially freed up time to grow and become more complex and develop language. It also gave us room for information processing (ie short-term verbal memory space and connectivity) which was especially enhanced by the need for several jobs to be done to create the meal for the whole community and make it last as long as possible (we had to learn to get along on many levels, communities grew, storage techniques, foraging techniques etc). So it’s not just applying heat to food, but the creation of meals. Wrangham suggest tubers were the critical food, whilst others insist it was meat. I would say it was both, not to mention, herbs, wine, fermented products and then of course with domestication and the addition of dairy (and cheese! woohoo) 50,000 years ago which was the emergence of “behavioral modernity” the great amplification of our intelligence. Food baby, it’s all about the meal (environmental and food interconnections). You can check out my blog on wordpress “the meal matters most”. Effects of potato fiber and potato-resistant starch on biomarkers of colonic health in rats fed diets containing red meat. Paturi G, Nyanhanda T, Butts CA, Herath TD, Monro JA, Ansell J. J Food Sci. 2012 Oct;77(10):H216-23. doi: 10.1111/j.1750-3841.2012.02911.x. Epub 2012 Sep 5. Not sure if I’m buying the cooked food/speech connection. The evolutionary structures that speech is dependent on in modern humans are relatively recent – pretty much them come out of changes to the way that FOXP2 gene is expressed. This happened maybe a few hundred thousands years. Neanderthals didn’t express the gene in the same way and it is believed that they had a much more limited range of vocal expressions. However, recent evidence shows that cooking goes back to around 2 million years. Which nicely coincides with the emergence of Homo Erectus – which has facial and dental structures that are far more adapted to eating cooked food (smaller jaws and teeth, atrophy of certain muscle groups in the face and skull). Homo Erectus also had a great big brain – almost twice as big as Homo Habilis. So the timeline, as best as we can figure is is that cooking predated human speech (in Neanderthals) by around 1.5 million years and modern human speech by around 1.8 to 1.9 million years. As such, I wouldn’t draw that much of a direct connection between cooked food and speech. You can argue that it was a necessary requirement of speech *but* it seems tertiary in that cooked food led to other advances which led to other advances that eventually led to a genetic shift that allowed for modern speech over more than a million years later. Also, I’m thinking the fact that we don’t cook as much of our own food isn’t as much of a determinant of obesity as cost. Believe it or not we spend significantly less on food than we used to. Back in the late 50s and early 60s we spent around 25-28% of our total income on food (groceries, dining out, etc). The last numbers I saw (for 2009 I think) had that drop to around 10%. This ties into the evolution bit I just posted because we evolved in a food scarce environment. We’d binge on food to store up fat so we’d be able to survive lean times. If food is around we’d eat it because it made survival sense. Now that food is a lot cheaper (and requires far fewer calories to acquire) we have more of it around but our brains are still working under the savanna survival strategy. In other words, cheaper food leads to more food leads to obesity (by cheap I mean cost – not quality. Lots and lots of high quality food would still leads to lots and lots of high fat people). If food prices returned to what they were in the early 60s (as a proportion of our income) I bet you’d see a far more thin people around. Scavana, applies to a good beverage? Whoooo daaaahhh fug n whahhh dahhh fug? Savana = Barton’s gin n tonic. It’s a goddam conspiracy, q tonic & lime. DOH! Here at home for the most part we cook with whole ingredients, starting with a wide variety of raw foods. We are fortunate to have the means to live in and access a food utopia, not a food desert. As a society we have certainly come to luvvvv talking with each other about food, reading and learning about it (hence your wonderful blog and books), watching celebrities do “it” (meh), as much as eating it (almost…no, not even close). Cook on. Food, eating, and communicating. Michael, I’m sure you have read Adam Gopnik”s The Table Comes First. Anyone out there who has not, borrow it from your local public library and if you are taken as I was by the ideas and writing, then buy it for an entertaining and thoughtful read anytime. It’s also true that food is a proxy religion that divides people. Vegetarians can’t eat meat, raw foodists can’t eat cooked, there are allergies real and imagined, there are Paleo eaters and high carb eaters and low carb eaters….I haven’t even mentioned Kosher, Halal, and Brahminical prohibitions against eating food touched by low caste people. The day everyone shares the same foods is the day everyone speaks the same language. Dream on. companies have websites which give details on their offers. the services you want in the self-storage site.